Maybe in the distant past we’ve had more contestants entering the Tall Tales Contest. Maybe in the distant past we’ve had more entertaining speeches in the Tall Tales Contest. Maybe in the distant past we’ve had more deserving winners in the Tall Tales Contest. 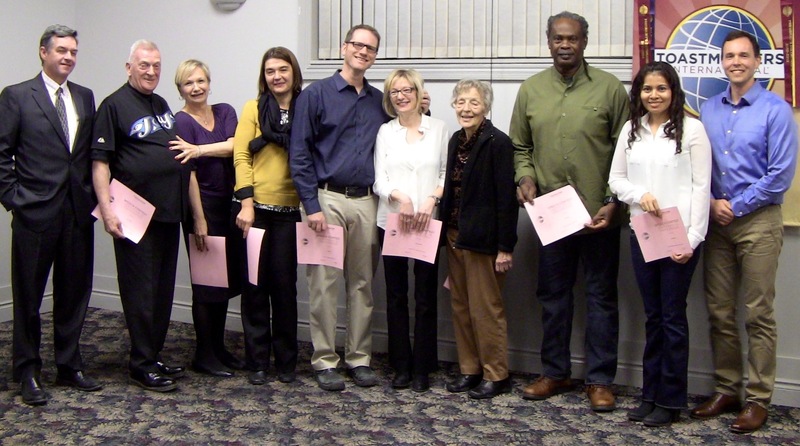 But last night, there was nobody in the full-house crowd who could remember a better attended, better run contest with a more deserving winners and contestants than the First Oakville Tall Tales Contest for 2015. In photo above from left to right: Contest Chief Judge Hal Shaw, John Smissen, Deborah Bartucci, Olga Gappasova, Adrian Scott, Katherine Ryell, Loreen Patrick, David Ruben, Rosa Rodrigez and Contest Chair Mark Molder. And the winner was our own president Toastmaster Adrian Scott (right) whose Tall Tales speech about an alien invasion was hilarious and as farfetched as anything we’ve ever heard. Second place was Deborah Bartucci’s Tall Tale about getting facial reconstruction was right up as well as one of the best Tall Tale speeches we’ve ever heard. John Smissen’s third place win as the pregnant man was one of John’s best speeches ever and John knows how to deliver a great speech and did so last night. And there were eight contestants including several very new members who bravely took to the stage and gave really excellent speeches! All of the contestants raised the bar when it comes to the club’s Tall Tale Contest and next year should be amazing! Expect costumes and props!! 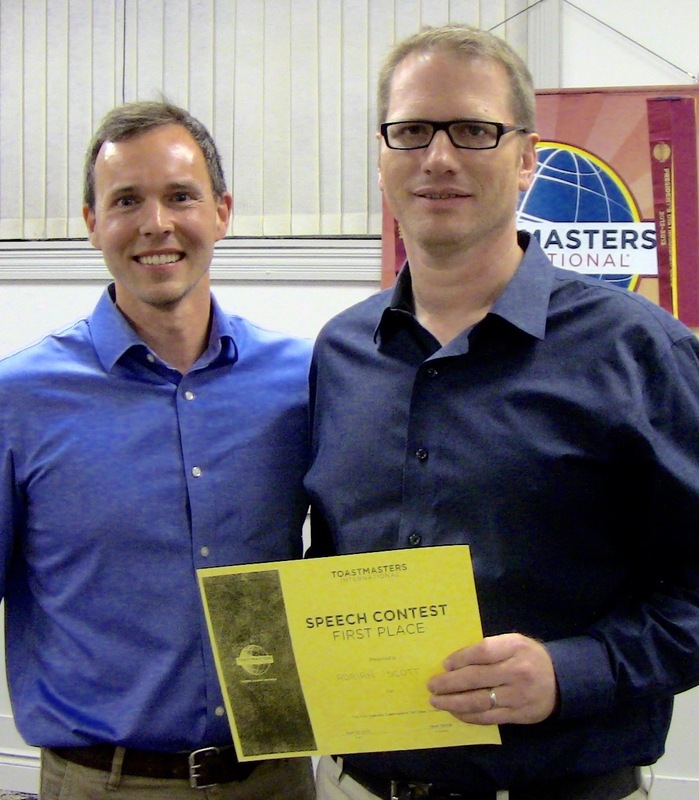 Members of First Oakville Toastmasters can review the speeches which they can view in their DropBox folders.